UPDATE: Congratulations to Gemma! Her comment was randomly drawn to win Bridget’s book. Thank you, everyone, for participating! 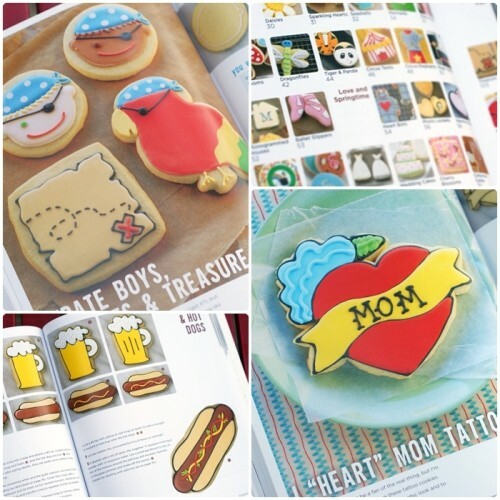 Decorating Cookies, available at amazon, Barnes and Noble, and many other places, I’m sure, offers over 60 cookie decorating ideas–cleverly pictured in the Table of Contents so you can flip right to what you fancy–for everyday, birthday, family fun, and all the seasons. 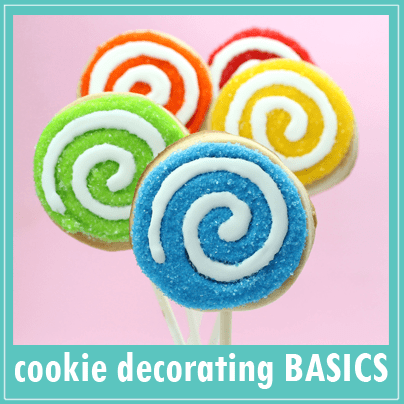 Bridget of course covers all the basics of cookie decorating for beginners, including the supplies and equipment you need, and the techniques, including piping, flooding and embellishing. Her list of cut-out cookie recipes is more impressive than in any book I’ve seen: vanilla-almond, chocolate-hazelnut, key lime, gingerbread… yum! What do you want to decorate? Mermaids, owls, robots, or wedding cakes? Maybe some daffodils, beer and hot dogs, strawberries or treasure maps? How about squirrels, Santa or ice skates? It’s all in there. I snagged this photo below from Bridget’s blog, which gives you a glimpse between the pages and the fabulous photography of Steve Mann. And extra super duper bonus, Bridget brings along her cookie decorating pals. She has a few of your favorites (I’m including myself in that bunch, thank you very much) making guest appearances and showing you some of their own tricks. Who? Well, me, yes. And also Gail of One Tough Cookie, Callye of The Sweet Adventures of Sugarbelle, Amanda of i am baker, and Marian of Sweetopia. See? I told ya’ they were some of your favorites. book will ship directly from publisher to US addresses only!! 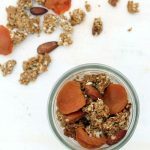 I love your blog and Bridget’s blog (and her name!) The book looks awesome! I love decorating cookies. I would love some new inspiration. This book looks amazing, would love to have a copy! I love her blog and can’t wait to read her book. It looks amazing! Would <3 to win the book. The sneak peaks makes me want to have it. Her cookies are gorgeous! The cookies on the cover of the book look very good ! Thanks for the giveaway! This is an awesome book! The book looks awesome. I do cakes currently but the occasional cookie. Would love to get into it more. Darling. Creative. Too cute. Would love a copy of this book! I love the pirate cookies!The book looks like good one to add to my collection! Thanks for the giveaway. 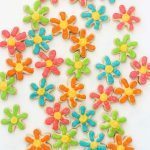 Such cute cookies, and such great inspiration! What a fantastic giveaway! Love the mushroom cookies. Would love to win this book. I LOVE Briget! When I first started decorating cookies, her site was the only site that I ever went to for tips! Thanks Briget for the book! 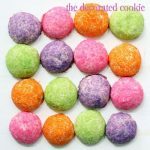 I would love to expand my horizons of cookie decorating! What a beautiful book. I can’t wait to get one either way. I love, Love, LOVE decorating sugar cookies with royal icing. This book is a must-read for me!! Books and blogs like these are what keep me from doing my housework! I would LOVE to win this book! I was looking at the pictures on her blog yesterday and almost started drooling! I have been wanting to get into cookie decorating. This book looks like just what I need to get me started!!! I would be super excited to win a copy. I love baking cookies with my grandson. I would love to win that awesome book! I would love to win this wonderful book! I need all the help I can get! Would love to win the book, it looks fantastic. Those pictures! Looks like a great book. I would love to see this book – done very well. Congratulations! I love to win this fantastic book to do all that beautifull things to my boys. You guys are so talented would love to find out some of your secrets! I’ve always wanted to learn how to decorate cookies, and her work is beautiful! Thanks for the chance to win! I have been eagerly awaiting this book. Congrats on your part! I was sold when I saw the beer and hot dog image…and the bunny in the hat which is adorable! I would love to win this for my daughter who loves to decorate cookies! 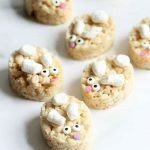 bake at 350 was the 2nd cookie blog I found. I was so enthralled with what she created! still am! Talented, Talented Women!!!! Just in time for the Holidays!! Adore Bridget 🙂 I’m so happy for her!! What a great and thoughtful giveaway! I hope I am the lucky winner of this super cool book. Looks great! I’d love some new cookie ideas! I would love to win this book! My cookie decorating skills are pretty abysmal. Looks like such a great book! I would love the book for inspiration and direction! I make cookies each year for kid’s birthday parties as well as sometimes for my nieces and nephews. Looks so cute, I would love to win this! I am new to decorating and love all of the inspiration from blogs I have found. I would love to be inspired by a book! Would love to win this give away!! Big fan of you both! I just made my very first decorated cookies last week for my baby girls birthday, had so much fun. They were far from perfect, but I was very proud of myself. Would LOVE to win this book, thanks for the chance. This book looks amazing! What a fun giveaway! This is such a beautiful book. Thank you for the inspiration and the giveaway! Such a cute book & perfect for the holidays! Ooh la la la! Can’t wait to get my hands on this one. It will go right next to your books, Meaghan! Thanks for another awesome giveaway! When decorating cookies or party ideas I have always turn to Bridget for ideas. She has a way of showing you how to do it. I would love to have this book…I have been following Bake at 350 for awhile. This book looks amazing, can’t wait to get my hands on a copy! Congratulations on your cameo in the book! Bridget definitely picked the shiniest of sugar cookie stars with you five. I can’t wait to get my hands on the book…giveaway or otherwise. Bridget’s book looks fantastic! Congratulations! Looks amazing! Hope I win! How I would dearly love to win this book. Enjoy decorating cookies with my grandchildren. Bridget’s book looks like lots of fun. The more books the merrier. I love decorating cookies! Just last night I baked the cookies til 10pm and tonight i’ll be decorating them for a friend’s housewarming! Looks like a great book with some fantastic ideas. If these pictures are any indication of how delicious these cookies MUST be!!! !….MY GOODNESS they look amazing..absolutely amazing!! I just started to learn about cookies decorating. What a great book to help me learn. I would love to win one! I have been so excited for this book to come out! Congrats Bridget! this cookbook looks awesome, so many great ideas!! Would LOVE a copy of this book for wonderful inspiration! Beautiful! I love her blog and would love this book. What a fantastic book and great giveaway! I love cookie decorating. Hope I win!! This book looks like it has tons of creative ideas. My daughter and I would have so much fun learning how to make these cookies. Ohhh! pick me, id love to have it!!! What a wonderful book thanks so much for the giveaway! me me me me me!!!! However, I have a copy on order WHOOOP – I could use this as a fun GIFT! I would love to learn to make beautiful cookies and also teach my granddaughters! Yay!! I would love to win this book. It looks so awesome. Ooohh…this book would be awesome to win. what a beautiful book! thank you for sharing your inspiring decorating techniques! As you know, I’m not a US resident but can provide a US address, so assuming I can enter? This book looks great – lovely photos, good directions and NEW ideas! Her book looks so amazing..I hope to win it! This book looks great. I love the detailed pictures. Thanks! My mother grew up in a bakery owned by her grandfather. She’s wanted the KitchenAid Professional Series stand mixer for years now. For her 60th birthday, this year, I brought her one. She was so excited! She loves baking and this book would be a perfect surprise to go along with her new mixer! Oh this book looks great! Love the dragonflies on the front. What a GREAT giveaway. If I were to win I would make everything in this book!! I lOVE it! This looks like it is a quite lovely book with tons of helpful photos. I am fairly new to the site but absolutely love it. I so excited and crossing my fingers. the cookies look beautiful. looks like a fun book. This book looks awesome. I would love to make and bake out of this book. What adorable cookies! Would love to win this book! This book looks fabulous! I’d love to make those mushroom cookies! I would love to have this book for cute ideas. Just look at all the people that follow your blog! That’s fantastic. cookbook, thanks for the chance! I would love to win this for my daughter. She is wanting to become a chef but in baking goods. This would be a great start for her. Wow! The previews look amazing! Hope I win this gorgeous book! those dragonfly cookies are adorable! I just started decorating cookies and this book would mean the world too me! Awesome giveaway. I cannot wait to get my hands on one of these books. Thanks for the giveaway. Just started seriously wanting to paint the perfect looking cookies like you do. Unfortunately I really need help!! This book may do it!! Thanks for the giveaway! This is a wonderful book. Love your blog and hope to be as good as you one day. This book looks gorgeous! Definitely in my Amazon wishlist! Me, me, me! I’d be so thrilled to win a copy of the book. Crossing my fingers now!! This books looks like it would have some inspiring ideas! The book looks amazing! It would love to win it a good friend of mine. such a good present for my sister! I would LOVE to win this cookbook! 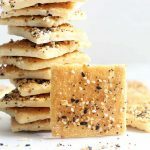 New to baking, I need all of the help I can get. Your blog is amazing!!! This new book looks great!!! I just LOVE the direction that cookie art has taken… thanks to talented people like you.. it’s become a guilty obsession! 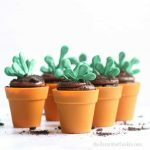 Recently discovered her blog and I can’t get enough! Good to know she has a book for more inspiration, can’t wait to read it! I can only dream about making the amazing arts in this cookbook and yours. We try hard though. Would love to win it. 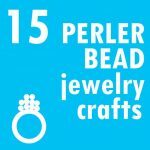 A wonderful, generous giveaway—thank you!!!! I love cookie art! And I would love to win Bridget Edwards’ book. Thanks again for the opportunity. This looks like a very handy book to have in the kitchen. Yay! More cookie ideas for my cookie cutter collection. I love Bridget! She is so creative and her cookies are always so cute! The cookies look amazing. I can just see myself pigging out because they are a visual feast. What a lovely hobby…the book is beautiful! This looks like fun. So far I haven’t gone beyond the usual Christmas cookies. I would love to have this book. Looks so yummy! These ccokies are amazing. I would love to have this book, even if only to dream! Look at all the fun we could have! The cookie decorators at our house could have a field day with this book! Thank you for the chance to win. This book looks amazing! I would love to be able to decorate like Bridget. Love it! Love Cookies! Want the book! My daughter would love this book. She is a great self-taught cake and cookie decorator. I love the dragonfly on the front cover!!! This book looks lovely! 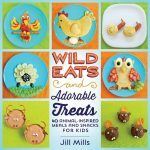 With 4 sons who look forward to Christmas cookies (and cookies all year, for that matter), this book would be incredibly fun and helpful!! Thank you for sharing info. on this fun site. I have copied Bridget’s cookies for a while now. To have the book would be heaven. It would be dogeared and stained very quickly! Oh I would love to get the book!! I love her blog too.. Your book looks amazing! I have no idea how to decorate cookies and would LOVE to learn! I would love to own this book to use as a great reference tool. My fingers are crossed! Would love this book! So happy for Bridget! The books looks great. Can’t wait to read it. I have been looking into custom cookies the past few days and stumbled onto your blog. That book looks amazing! I hope I can find it in a bookstore soon. I just made my first batch of decorated sugar cookies two weekends ago. This book would be great! Those pictures are great. That will be a fun book to read. 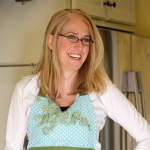 I love Bridget and I’d love this cookbook! 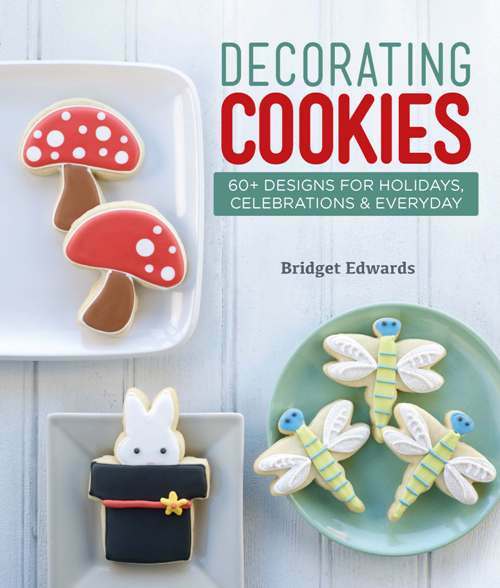 Have followed Bridget for years, would love to have a coolection of her cookies in a book! So cute! Thanks for the great giveaway! I would love that book!!! Such cute ideas. Would I find it in any good book store? I want and need this book ! I love baking! And look to other bakers for tips and ideas-however it’s very hard to see decorating ideas on a 2×2 I phone 3 screen since I don’t have Internet. Haha. I made wedding cake cookies for the first time for my daughters bridal shower in may and boy were they cute but boring. I could use better inspiration and this book would be perfect! Thank you. Even if I don’t win the book I plan on buying it for my best Friend!! I’d love to be able to make cookies that look like those! Amazing work! I just made wedding cake cookie favors for my Mom’s wedding – first try at professional type decorating 😉 – and I would love to learn more. This book looks amazing..just what I need to help me with my cookie decorating dream. Thank you so much for the chance to win! 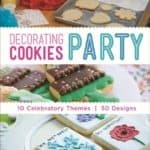 The book looks amazing, I am new to decorating cookies so this book will be very helpful. Keep up the great work and keep the books coming we really love your talents! So happy for Bridget and can’t wait to check out her book! can’t wait to start baking Christmas cookies!